Originally from Haverhill, MA and now a resident of Dover, NH, Pete Conrad holds a degree in English, Literature and Cultural Studies and is an accomplished bass guitarist. Pete has written screenplays for this and each of his other novels, The Arbiters, Going Home, and The Suicide Flowers. Last year, a short film version of The Suicide Flowers made the rounds on the film festival circuit, sparking the interest of well-known filmmakers. On his inspiration: "I wrote Survival of the Sparrows as a short story over ten years ago, and I went back to work on it last summer because I don't think this scenario is too far of a stretch in today's 'I have a bigger button' world. At some point, our adversaries are going to say, 'That's enough,' and what will we do, as individuals?" Imagine, for a moment, an America that has turned inward, disrespected and disregarded the wishes and feelings of the rest of the world (not too hard to do in these times really). 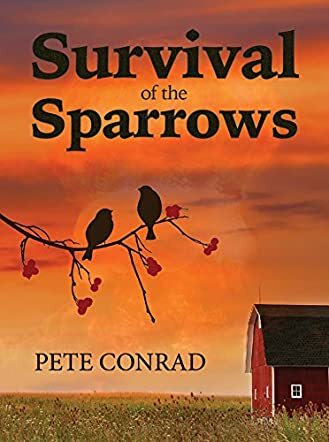 This is the premise of Pete Conrad’s novel Survival of the Sparrows. A coalition of forces from Russia, North Korea and the Middle East has invaded the American homeland and is pushing on with its plan to rule the USA. In rural Johnsonville, Georgia, May and Winston Sparrow, a middle-aged African-American couple, are worried the invading forces will pass through their small town on their way to take over Atlanta. Winston has constructed a false wall in his barn where he and May will hide out until the invading army has passed through. Things don’t go quite according to plan for the couple, though, and they are caught, trapped in their wall space as the Generals make May and Winston's smallholding their Southern headquarters. Survival of the Sparrows is a chillingly frightening reminder of just how fragile our world order and peace truly is. Given the current situation in America and the rest of the world, the scenario painted by Pete Conrad is not too far-fetched at all. This book is a fantastic read, with Winston and May lurching from one crisis to another. Fast-paced, with just the right amount of stereotyping and violence, tempered by the true spirit of human kindness and understanding, this is a very enjoyable book. The two main characters, May and Winston, and their travails, trapped inside their tiny wall space, were incredibly easy to identify with and I particularly enjoyed the good ole Southern accent and slang in the dialogue. Intentionally or not, Conrad has hit upon a realistic scenario that was both believable and riveting to read. I truly couldn’t put this book down, even when I knew I should be doing other things. That is probably the best tribute I can give to author Conrad. A real bottler of a read!